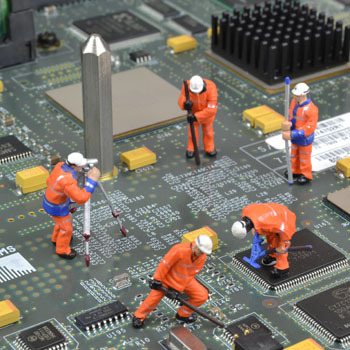 Maintenance contracts for Cisco hardware that means if your hardware becomes faulty, we'll replace it. Simple. Why would I need a no frills, break-fix contract? What length is the contract? The contracts are for a minimum 12 months. Are the WIC cards or modules etc. installed in the product covered by the contract? Yes, as long as the serial numbers are on the contract. If you find a fault with any contracted hardware, give us a call and we'll decide if the problem is a hardware, configuration or IOS software issue. If the hardware is at fault, a replacement will be sent next business day – provided you've let us know by 2pm. All you have to do is return the faulty hardware to us. What Cisco products will Go Maintain's no frills, break-fix contract cover? Any Cisco hardware, regardless of age and any model, as long as it's working at the start of the contract. What happens when a hardware failure is identified? Call Go Maintain Ltd (24 hours a day) – tell us your company name and contract number, together with the product and serial number of the faulty part. We'll give you a Fault Ref Number (FRN). An engineer will call you back to check it's not a software or IOS issue that we can fix remotely. A replacement will be sent out to you referencing the FRN number. Then, just return the part to us, referencing the FRN number within 10 working days of getting your replacement. If I know the part is faulty why go through the troubleshooting process? When you tell us about a fault, our support engineer will troubleshoot the issue to identify the faulty part and check it's not part of a larger problem. Even though it might seem quicker and easier to just send a part, if it arrives and still doesn't solve your problem it will mean more downtime for you. Will my replacement parts be new? Where possible your replacement part will be new. If not, it will be fully refurbished to our own 'as new' standard. All replacement parts will be automatically logged under the same no frills, break-fix contract until the contract is due for renewal. Simply make a list of the parts you want covered (including any modules installed) and then just give us a call 24/7 on +44 (0)1279 406999 or email sales@gomaintain.com. Copyright © 2019 Go Maintain Ltd. All Rights Reserved.